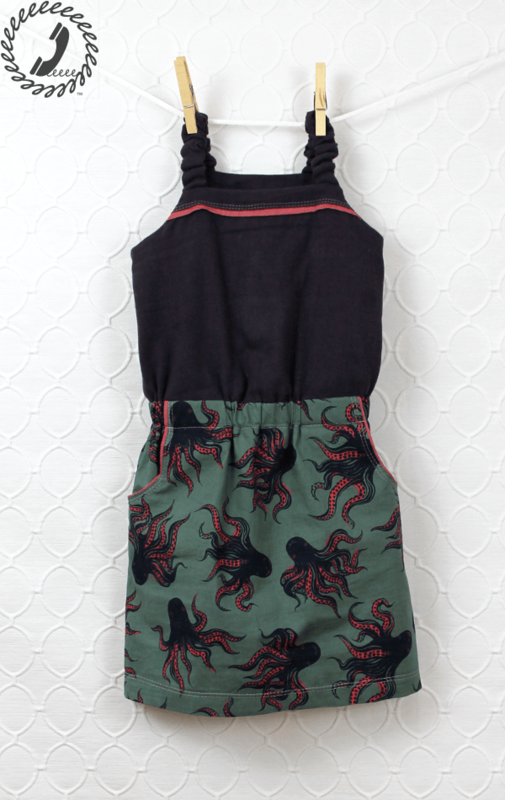 I know I keep saying it, but probably my favorite view of the Paneled Sunsuit is the Jumper (view D in the pattern). It has the same bodice as the rest of the combination views, but the bottom is a cute little A-line above-the-knee length skirt. The sizing is the same as the rest of the pattern which is newborn through 12 years. I ADORE this jumper on Bean and I think this view is perfect for the tween group. 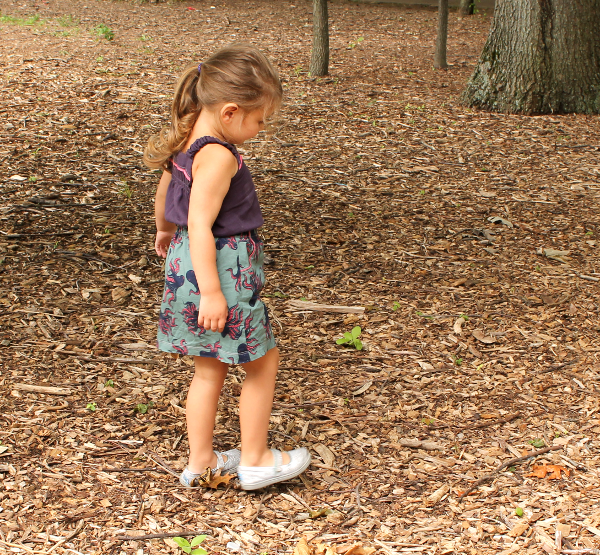 As I mentioned before, Bean grew through two sizes in the Paneled Sunsuit since the early spring. This jumper is size 4t and she is already in the 5 size so in these pics the bodice is a bit snug and the length is on the shorter end for reference. But that won’t stop her from wearing it, hehe. 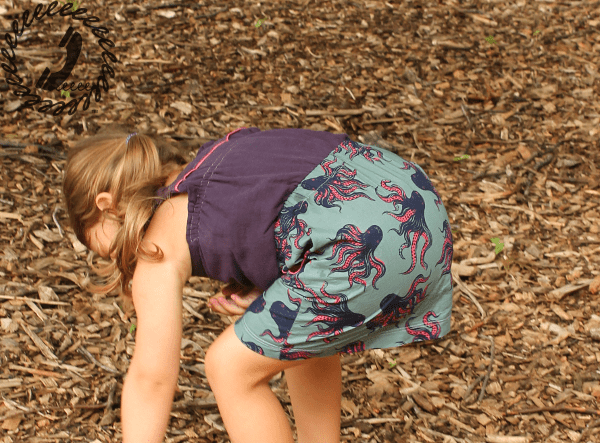 She loves her “octopus” dress. 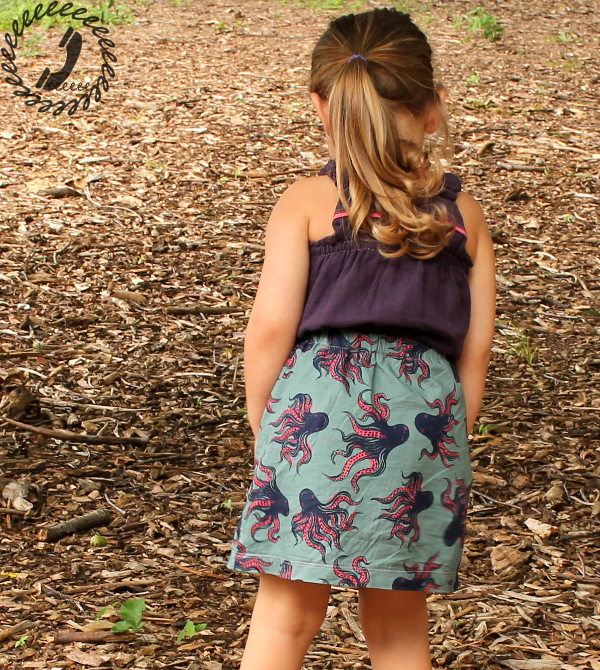 The jumper skirt has regular and faux piping pocket options, the same as the rest of the pattern. I’m a sucker for that faux piping though right? You’ll be shocked to hear that all these fabrics came from Imagine Gnats (*affiliate link). I mean, do I buy fabric anywhere else anymore, hehe? 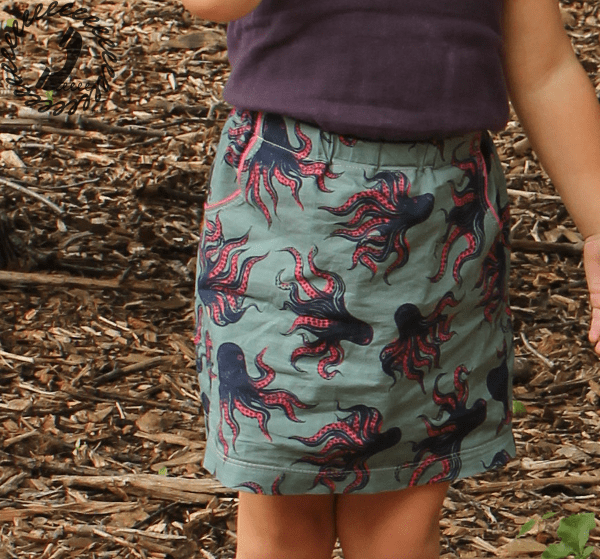 Anyway, I had grabbed the cotton + steel octopus fabric during a sale awhile ago and (gasp!) there was only 1/2 a yard left. I was super sad and almost took it out of my cart, but at the last minute I envisioned a cute little skirt for Bean and now I’m so happy I bought it. The faux and flat piping are an interweave chambray that is out of stock (oh how I adore those chambrays), but the main bodice fabric is a soft double gauze that you can still purchase here (*affiliate link). Even a bit too small, this jumper always looks super comfy to wear. Unlike some other things Bean has in her closet, it never twists or pulls up during the course of the day. It’s nice to not have to say “pull your skirt down” or “pull up the back” or even “put your hands in your pockets and twist to the front” throughout the day, hehe. Since she’s four, I have her wear some modesty shorties under her skirts and dresses, but I’m happy to report they didn’t show once at the park the other day. I like that she can wear shorter styles like this, but still move around and not worry about her underwear showing. 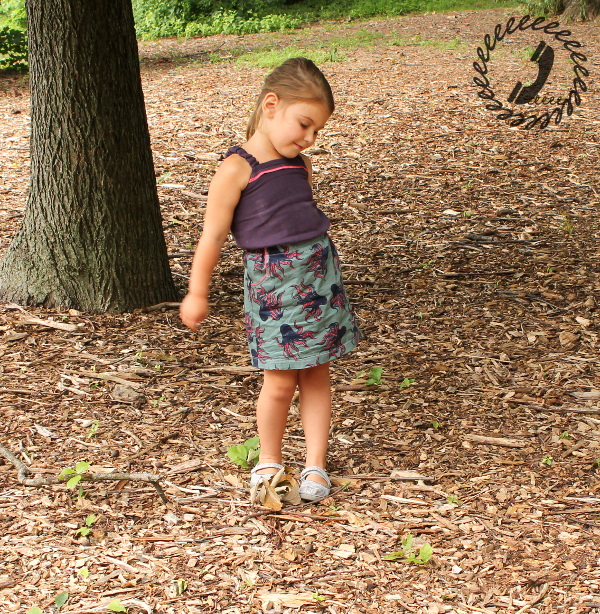 The jumper view was the one that pushed me to finish the Paneled Sunsuit this summer instead of doing a “simple” pattern for my first release. I loved the look so much and was afraid (with the crazy romper trend this spring) that if I waited then someone else would release a romper pattern with an A-line skirt option before mine was released. So I took on the huge undertaking of designing and grading a pattern that truly uses four measurements (height, chest, waist, and hip) for a great fit. This may have only been huge since it was my FIRST fully graded pattern, but it was still a daunting task. Luckily there were very few bumps in the road, and now I have a great measurement base to work from so my subsequent patterns (yes there’s another one in the works already!) should be quicker to release and for that I’m so grateful. I still have a few more of the Paneled Sunsuit views to show you, as well as the AMAZING tester pics, but for now you can look through the views I’ve already detailed here. Does your favorite keep changing as often as mine does?